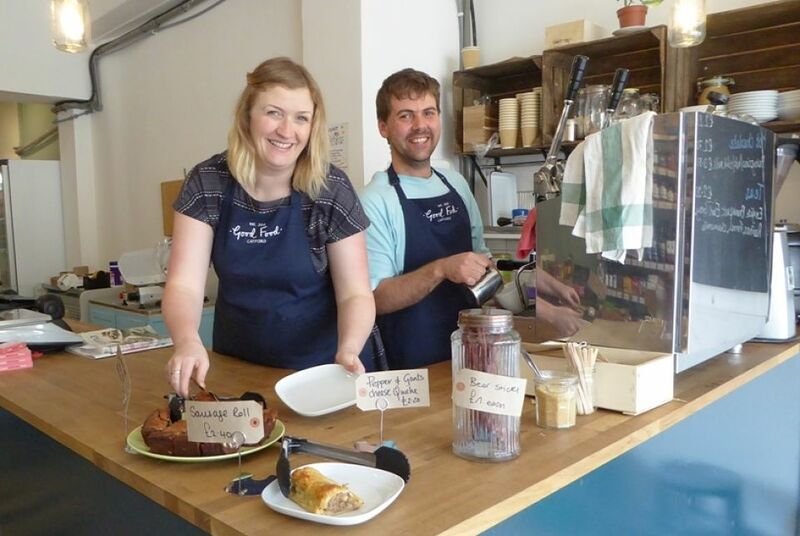 Good Food Catford is a community-centred grocery store and deli, focusing on local, seasonal and wholefoods. Vicky Skingley, the founder, is a nutritionist who has always been interested in food and what real people eat. The shop opened its doors in March 2015, and is currently employing five part time staff. Vicky is a Lewisham resident and is supported by London Small Business Centre, Lewisham Business Support Initiative, funded by the London Borough of Lewisham. We spoke to Vicky about Good Food Catford, the business support she received, and her hopes for the future. There wasn’t a shop like this in Lewisham, certainly not in Catford. There was a need and desire by local residents to have something like this. People want to shop locally now, they don’t want to go to the supermarket – people are more interested in where food comes from. I live here and I wanted to shop somewhere like this. We are a health food shop, in a sense that we sell food that is good for us and good for the environment. It’s all about what is responsible and the right thing to do. We pay our staff a Living Wage, which is a struggle for a small business. Once we are properly settled we will be looking to hire an apprentice, so that as a business we can give people relevant, useful experience and life skills, to help them get better jobs in the future. It’s not about just showing them how to use the till. We source as much as we can locally – the bread comes from Lewisham, chocolate from a company based in Brockley, coffee is roasted in Grove Park, one of our tea suppliers is based in Forest Hill. The plan is to source some vegetables from allotments, so that would be Lewisham as well. Some smoked salmon from a smokehouse in Greenwich, Northiam Dairy, just down the road in Kent supplies our milk. I buy salad bags from Sydenham Garden – they are a charity that helps people in Lewisham who are living with or recovering from mental ill-health. It is a real boost to them to know they are selling commercially. Roasted fava beans are an unexpected best-seller! We sell loads. What have been the main challenges of opening a shop? Raising enough money! Things also took longer than expected, in particular, signing the lease documents. Also there were unexpected expenses – only last week the water pump flooded the shop. My main ongoing concern is that more shops around here close and get turned into flats. It is a really big issue. This location needs to be seen as a destination, but if more shops close people might go somewhere else. How did you raise the start-up capital? I used crowdfunding for the opening of the shop. This was matched by the Major of London High Street Development Fund. I also invested own funds and took a Start Up Loan. I used the loan to get the alcohol licence, and to get some work done following the environmental licence inspection, buy some stock and a meat slicer. How important was the business support? The support I got from the London Small Business Centre and my adviser, Lana Hersak, was really useful. Especially the cash flow forecast, I’ve not done this before. Getting the numbers down and figuring them out was really helpful. I would absolutely recommend the service, I already tell other people about the support I received. I’d love to have some land to use as growing space. I’d like to be able to grow some stock that I sell. One of the projects I’m working on is with local schools in Catford that grow vegetables, so I’ll be buying some veg from them soon. I would love to open another shop elsewhere, probably more centrally – maybe more of a café and less retail. But that’s a long term plan.